Ace reporter and bibulous (LMLWD) playwright JOHN MINSON trod the trail of December launches for us. We made him write his reports before he disappeared in a Festive Haze, so here’s a trio of new Minson Outings. Coming next month: St Brides! 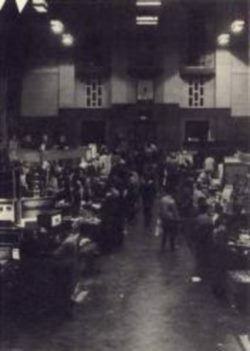 A panoramic view of the inside of London’s Horticultural Hall, as it was during the one-day Christmas Microfair a couple of weeks before Christmas. Just look at all those Christmas present hungry bargain hunters. Remember Christmas still? Off we went again, leaving Ludlow, bleary eyed, at five past something horribly early, before the sparrows had even started coughing. Down to the Horticultural Hall, where we found a host of similarly still-bleary-eyed stallholders shuffling goodies out of car boot and van and into the Hall. Meanwhile the super keen earlybird Microfairholics began queuing in front of the turnstiles. As usual, a good time was had by all — even if the innocent members of the public had to put up with our very own illustrious and far from shapely editor parading around in a Monty on the Run jog suit. (Last time he did any jogging someone was chasing him!) Playing Tweedledum to the editor’s Tweedledee was similarly shaped Solutions PR man and Ex HCW Editor, Dave Carlos. Between them they were more frightening than Friday 13th — which happened the day before. A fun day for all, and plenty of interesting goodies on offer, as usual. Maybe see you at the next one? Not quite a night of a thousand stars, but certainly a lunchtime of half a dozen Bloody Marys, as tension mounted while four finalists battled it out for the title National Computing Game Champion 1985 in the plush surroundings of London’s Savoy Hotel. The contest started back in August when local papers were used to select 15 regional winners. From these came a final four who proved their mettle using a second tape with special codes to verify high scores. So it was that 11 year old Steven Kitely from Cardiff; Lee Schofield, just two years older, from Sheffield; Robert Head, 15, from Ipswich and a veritable wrinklie, Bryan Hulme, 24, from Runcorn all found themselves thrown into the arena for the playoff. Having braced myself for the suspense of the contest with a drink, I sought out Mike Meek, whose company, Mikro-Gen was sponsoring what Mike sees as the FA cup of computer gaming. While the software stars fought a 15 minute Battle of the Planets, Mikro-Gen’s new game chosen for the final, he told me that next year he hopes that each of the computer magazines will enter its own champion — which sounds like one way of settling friendly (?) rivalries. A couple more cocktails and it was all over, a triumph for age as Bryan Hulme took the prize. And he looked well pleased as he accepted the award, though I was unable to ascertain whether that was because of the cheque for £250 and the trophy or the kiss from page 3 girl, Suzzanne Mizzi, who presented it. 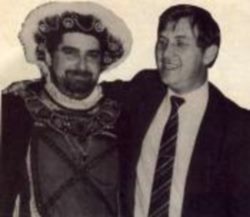 Henry VIII (on the right, in fancy dress) shares a merry quip with Mike Meek (on the left, also in fancy dress). Or was it the other way round? 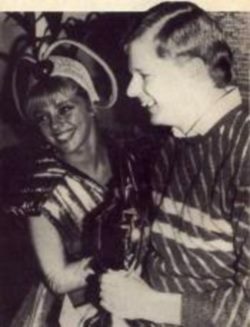 Either way, rumours of Wilma becoming Henry’s 7th wife are unfounded. I think if I could choose the age I lived in, Tudor England would rank high — providing I wasn’t a peasant! I can see myself quaffing a flagon of ale and tossing a ham bone over my shoulder before going out wenching with the King. As for the fashions of the time... well, they make even my loudest shirts look tame! Nice, then, of Mikro-Gen to launch Sir Fred, their game of daring do in days of old, at London’s Tudor Rooms, a theme restaurant that recreates the bawdy era. This gave the assembled hacks a chance to sample mead, favourite tipple of Sir Lunchytyme O’Booze, court reporter to Henry VIII. Meanwhile a historical cabaret, complete with dancing bear and beheading (without which no Tudor dinner was complete) was performed. Sir Fred being a Spanish knight there were no programmers present, but monarch of Mikro-Gen, Mike Meek, was beginning to wonder whether their ancient gallant would prove more popular than Wally Week. It’s a different sort of game and I reckon it will go down well. Not that I’d forgotten the twentieth century or the Wally tribe. Also on display was Three Weeks in Paradise, which could turn out to be the last Wally game, though it could be appearing in a 128 version. Originally destined for the Mikro-Plus it strands the gormless family on a cannibal island. Thank heavens they didn’t choose this as the launch theme then. I’m sure breast of chicken is far more succulent then breast of Wilma! Okay, so I messed up. I thought Graeme asked me to cover the launch of a game called Drink — obviously my sort of game. Only it turns out that he really said “Think!” and here I am, waiting to play a patently brainy game, against its creator, of all people. Not that drink was totally wrong, because the lovely Amanda Barry of Ariolasoft (a woman whose last publicity stunt saw her as a squaw tied to a tree by two cowboys, all for the benefit of those privileged Commodore users) is offering a bottle of Scotch to any journo who can beat Chris Palmer. I’m shown into the arena, and Mr Palmer’s calmness tells me he’s not given away too many drams that day. He explains the rules and he’s the sort of genius who can create a game of classic simplicity. Then he offers me the best of three which just may help the odds, so I accept. If you can’t win clean, go down fighting dirty. As Chris ponders my first move I fire my first question at him — a little interviewing to blast him off balance. I maintain a barrage of questions as he plays, and it transpires that the idea for the game is vaguely similar to four in a row, but that he really wanted to create a board game which couldn’t be played on a board. Think! consists of shifting rows and columns of counters, plus the spaces in between which even I can see could cause problems. There’s a multitude of options, and the computer isn’t infallible — though at its highest level it might as well be, the time it takes to consider every move. Chris advises caution in following strategies; it’s a game where the situation can change in a single move. This he demonstrates by winning his second game. Curse it — he can talk and think simultaneously. So, no whisky for me, but I’ve got something more valuable — a copy of the game and I reckon that Think!-ing is so addictive it just might keep me at my Spectrum rather than in the pub drinking.